Sounds like a great time and something to see for the kids! I remember being fascinated by the dancers’ feet when I was little. Sounds like a fun outing! I survived one year of ballet lessons when I was young, before begging my mother to let me drop out. At the recital, dancers of all ages ended up on stage together. My class’s contribution was to bourré across the stage together in one, long line, wearing flower costumes that itched like hell around the forehead and neck. Good riddance. sounds like a lovely, family centered event. I hope you’ll have the chance to report back on other Pacific Ballet School productions, and other dance events in the area. A Milk Flight! How cool. And that production of Snow White sounds wonderful. There seems to be a resurgence in fairytale themed shows and movies, which is probably migrating to other arts, too. Looking forward to Snow White and the Huntsman. I took ballet for a few months before my mom figured out I was only going for the cookie snack that we got at the end of practice. Obviously, my interests were in a different area. Holy cow! That’s a lot of milk. It sounds like a lot of fun though. I’ve never been to the ballet, but I fear I’d be sitting in my seat feeling like a moose compared to all the tiny ballerinas. What a fun experience. Growing up my mom used to take me to to matinee opera performances–I learned to love opera in that kid-friendly setting. So what was Kita’s fav milk flavor? 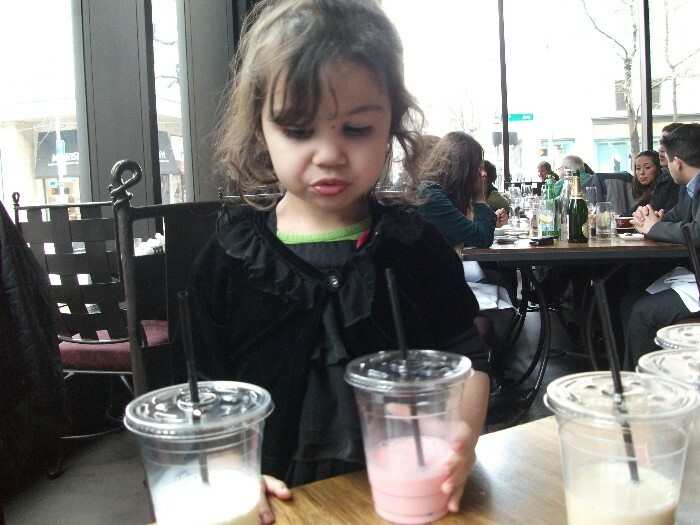 Her favorite was strawberry and she took that one with her. I LOVE the milk flight. 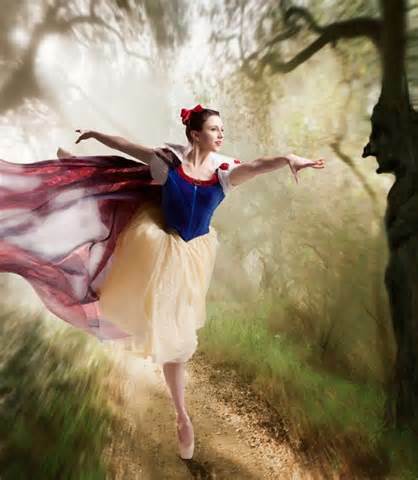 And wish there was a Snow White ballet near me to take my granddaughter to. I took a year of ballet and a year of toe ,and yes, I’ll never forget the lambswool and the agony. But I’ll never forget the feeling that clunky me could be graceful for an hour. I was pushed toward the piano, instead of the accordion, but always thought I could have made it in toe shoes. Looking back, my mother was right. Looks like a wonderful production—I love the picture! I have fond memories of getting a glass of chocolate milk – such a treat, we weren’t allowed sugary foods in the house – after seeing the ballet or musicals in downtown Pittsburgh growing up. Glad kids are still having that experience! The milk flight is a fun idea. I think taking the women of the family (grandmom, mom and daughter) is a wonderful bonding experience. I remember when my mom and I took my daughter to see the Nutcracker. So much fun. Heading to Seattle next week, Heather, with my teen. Purple Cafe might be on our list for milkshakes, thanks for tip. These are the kind of events from which memories are made and traditions are created. I know the girl who playing snow white! !